Today I came across a feature request that I had not done before – dialing a number from within an app. Some quick research shows that its possible using a specific URI scheme. In our case where we want to dial a number from within our app we need a way of telling the mobile phone that we want to make a call. There is a scheme for this purpose called tel:. A sample number using this scheme would look like this: “tel:+1-800-555-1234”. If you wanted a number to work around the world you would use an international number which includes the country code. Go here for more information: Cordova 3.6.0 Whitelist Guide. Of interest to this topic is getting Android to treat phone numbers (as well as URLs and mailto schemes) as clickable links in text fields. I’ve not tested it but try adding the following to your config.xml. Additional information on this can be found here: http://developer.android.com/reference/android/widget/TextView.html#attr_android:autoLink. When we run the above code in Android 2.3.6 the phone dialer appears and does so with our number pre-populated ready to be dialed. Unfortunately on iOS 5 this doesn’t happen. A quick review of iOS documentation implies that it should work – so I suppose its just broken. Its simple to install – just drag and drop the “m” and “h” files on to the classes folder of your xcode project. When you do this a dialog will appear with some options – be sure to click the radio button for copying “…files if needed..”. All in all pretty easy and straight forward, however now you have two methods of dialing a number within a single project. What you want is to use the tel: url scheme in Android and the Phone Dialer plugin in iOS. Within Sencha Touch we have something called the Ext.is object whose attributes reflect everything that you could possibly want to know about the environment that your mobile app is living within. Hi, thanks for your tutorial, which helped me a lot. I like the helpful info you provide in your articles. I will bookmark your blog and check again here regularlye! Good luck for the next! Well written. Great help. Many thanks. 1) try the tel scheme as described within the above article for android – it could be that Apple has fixed how they deal with it – I’m away from home ATM so can’t test this myself. 2) I don’t know what version of PhoneGap you are running (I’m assuming the latest version) but you could download and install an older version of phonegap provided that your app does not require a feature that newer versions offer. Try version 2.6. 3) Contact the plugin author and ask them to fix the plugin. 4) The link I provided contains a guide on fixing the plugin. If you’re not adverse to attempting to fixing it yourself you could go this route. Good luck, let me know how things turn out. make sure that the phone app is installed on the device, otherwise nothing will happen (although apple documentation state that appropriate error message will be shown). Hi… Can the dialer dial USSD code like *151# in iOS ? I don’t see why not – it is the same dialer that you use outside of any app. All you’re doing is launching and pre-populating it. Hi, it is work? it doesn’t work on my project… it’s a service called USSD… but I can’t find documentation about it. someone mentioned to make sure that that the phone app is installed on the device – for example if you are using an iPad then of course nothing will happen. 1. How is Phonegap involved in this at all? “tel” URI is HTML5 spec, right? Anyways, works for me without Phonegap. 2. Not able to figure out how to keep the app in the background. For example, how do i interact with the app, while on a call? The way it is working now is the dialer shows with the number pre-populated and once the call is done, use the back button to get back to the app. You’re correct, “tel” is in the HTML5 spec. Still, people wonder how to call inside of PhoneGap and so the impression is that its a PhoneGap thing when of course it is not. In older versions of iOS it was different – you needed a plugin to dial. Interacting with the app while on a call – my understanding is that you have to manually switch back to it just like any other app. The relationship between app and dialer starts and ends with the former launching the later. Its not like launching a child web view where you still have that relationship, where the app is aware of the child view and is “there” when the child view goes away. It may be possible though, but, I imagine you would need to talk to a Java developer and discuss making a plugin that fits your exact use case. Hi, Good tutorial. Could you also tell me how to trigger the call receive button while phone is ringing. I mean when someone call. Thanks in advance. My understanding is that you can’t – when you receive a call your app is suspended and the dialer/phone app comes to the front. Thats how mobile OS’s behave – a phone call will by design force any active app to the background so that the call can take over. 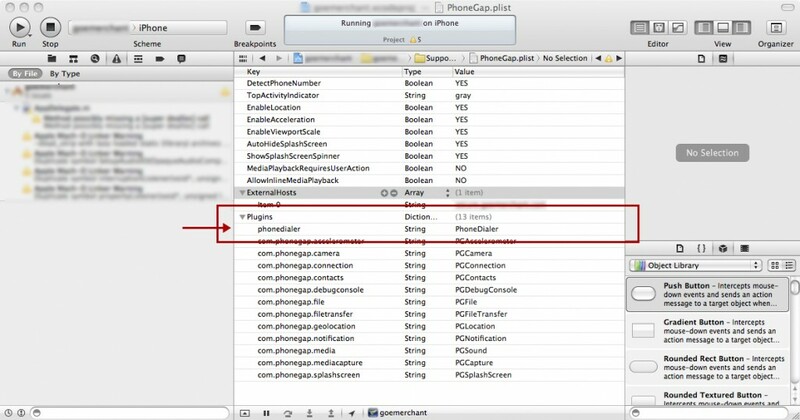 I must admit to not being intimate with Android / iOS ‘s inner workings – maybe a native developer (Java / Objective C) will know of something and in that case it would likely require a PhoneGap plugin. Hello…. the current behavior is how things work if you are using vanilla HTML5 to call a number. You should instead look for a phonegap plugin to instantly dial the number – I’m unaware if one exists. Good luck…. If a device has the capability to make cellular phone calls then yes, this will work. If the device lacks the hardware needed to make cellular phone calls then it would also be missing the device’s dialer app. Phonegap is not a replacement for either the required hardware or software. So guys can you tell me what could be the problem. Also, this wont work in the emulator, you have to test on a device. Apprecate the post, glad I noticed it on yahoo. I need help. I tried to devellop an applcation with phonegap. This application have to call a number but i doesn’t work. Can you please contact me by email ? Well….. before we get start PM’ing each other this is probably something you can solve yourself with just a budge in the right direction. 2) paste your phone-calling HTML into a post here, the issue is likely with that. 3) you can try using the very first example above – using an anchor tag formatted per the eample I provided. If that works then the issue is how you are coding your app. How can I record that calls?